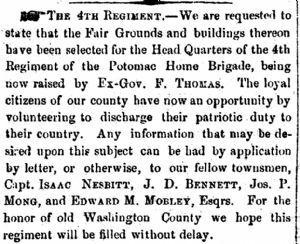 We are requested to state that the Fair Grounds and buildings thereon have been selected for the Head Quarters of the 4th Regiment of the Potomac Home Brigade, being now raised by Ex Gov. P. Thomas. The loyal citizens of our county have now an opportunity by volunteering to discharge their patriotic duty to their country. Any information that may be desired upon this subject can be had by application by letter, or otherwise, to our fellow townsmen, Capt. Isaac Nesbitt, J. D. Bennett, Jos. P. Mong, and Edward M. Mobley, Esqrs. For the honor of old Washington County we hope this regiment will be filled without delay.